The extent of my workouts consisted of walking 5-6 days a week. I knew I needed more than just walking to get in shape and lose weight. 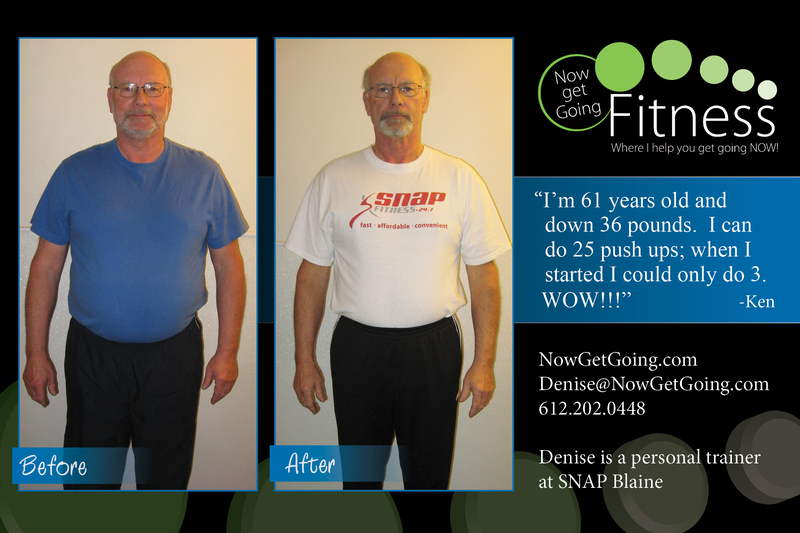 I met my trainer, Denise, through my husband. I always look forward to my training sessions with her, no matter how I feel when I enter the gym, I always have a great workout and leave the gym feeling great. 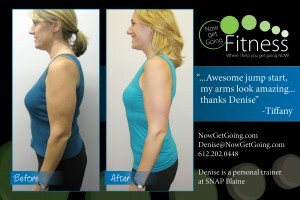 Within 15 week Denise has helped me lose 21 pounds and 13 inches and has helped me to become a stronger person. Denise is very knowledgeable, thoughtful, sensible and a pleasure to work with and to talk to. She is passionate about fitness and it shows through the energy and enthusiasm she brings to every session. Her easygoing, friendly personality creates a relaxed, comfortable atmosphere. She makes each workout challenging, creative and fun. She places a high value to correct form with each exercise. 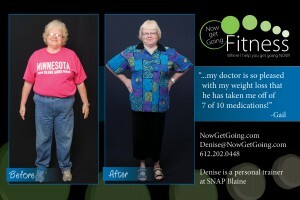 If you are serious about changing your life for the better, Denise will lead you every step of the way. 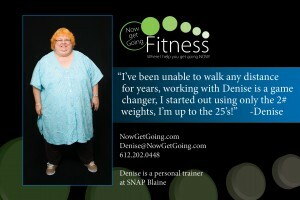 “Denise is more than a fitness instructor, more than a personal trainer. 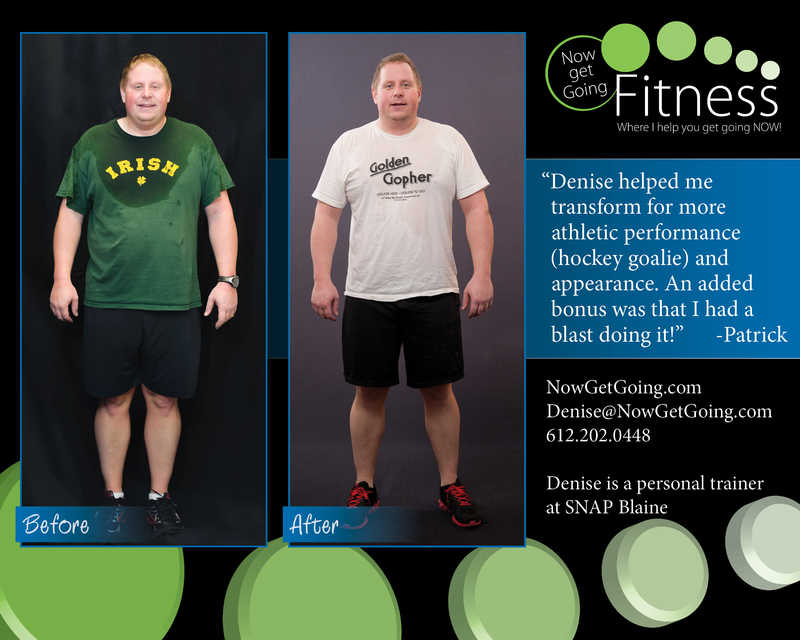 Denise is a life changer. She not only instructs to get physical results, she strives to align the mind, body and soul to achieve results. Words I use to describe Denise are…patient, kind, loving, supportive, encouraging, experienced, wise and understanding…all this with a firm hand required to reach the clients goals. ~Sandy Z.
I said those three sentence repeatedly. Denise was amused. “Yes, it will work,” she replied. “Just take the first step and get started.” I knew that I was going to prove Denise wrong; she just didn’t know it yet. When I signed up for her healthy weight loss program, I had no doubt that I would become healthier. I have high blood pressure and a family history of heart disease and diabetes and wanted to do my part to stay healthy. Under no circumstances did I believe I could lose weight. I was the one proven wrong. Denise’s program consisted of cardio and strength training twice a week for forty five minutes as well as healthy food preparations. Prior to taking on this program, I was eating healthy foods; however I never kept track of how much of that healthy food I was eating. Since I was now accountable to Denise to track my intake, I actually had to pay attention to what went into my mouth. It was a learning experience for me and so my daily calorie count dropped enough to make me begin to drop weight. I never felt as if I was on a diet. I just tracked my intake. I noticed a change in my energy level. In the morning I felt well rested and did not need the long “ wake up” time I had needed in the past and I no longer had a “ slump” in the afternoon. Experiencing these changes in my life made it easier to commit to this program. I did not see myself as on a diet; instead the eating habits just became a way of life for me. Sometimes I went a little wild with my calories but I always went back to the program the next day. Because I had taken a leap of faith in doing this program, there were positive rewards. My first reward was that I actually lost weight—18.2 pounds! I am stronger- I actually like when Denise pushes me to a use a heavier weight. I feel energized throughout the whole day. My blood pressure medication was cut in half; I may never be totally off of the medication due to my family genes, but I am thrilled that the dosage has gone down. As a bonus, my husband has lost eight pounds from the “halo” effect of my healthy changes. After the program was over, I maintained my weight loss for two weeks and then signed up again because I now believe that I can be the size I want to be and the weight that is healthy for me. In January 2006 I started working out at Snap Fitness in Blaine. First I got a physical, then the go ahead from my doctor. My goal was to shape up and trim down for my son’s upcoming wedding. In two months I took off 12 pounds; then one day at Snap I didn’t feel too good. The next week I lay in Mercy Heart Center wondering if I would make it through. Four stents later I got a second chance at life. Finally last April 2010 I decided to make the most of my life. After weighing in at the doctor’s office at 231 pounds, I called Denise and asked for help. So look at my results; I’m 61 years old and down to 195 pounds. I can do 25 push ups; when I started I could only do 3. WOW!!! Look at the bloodwork – cholesterol and blood pressure went down. WOW!!! I am a new person, living out my second chance. Denise has played a huge role in my change and I am so grateful. Denise is a professional who cares about her clients. Most people will see her as a fitness instructor, but she really is an angel disguised as a personal trainer! “at 50 I decided to make a lifestyle choice and change…..now I am training to run a half marathon, I am amazed!” ~ Rich L.